The general view is that Camerata Florentina invented opera at the end of sixteenth century as a counterpart to Greek theater. We assume that some features of ancient tragedies—especially confrontation with an inevitable fate—effectively influenced the first operatic works. We argue that in some operas, legal and moral rules functioned as an instrument of fate, and that Camerata Florentina followed this philosophical anthropology. However, a very rigid understanding of fate by ancient writers had to be modified due to the view that people have a certain amount of freedom in their actions. We see this point as important for evaluating certain stories told in librettos. Our claim is that many operas successfully continue (a modified version of) the ancient ideal of the tragic fate of humans, forced to make choices between dramatic alternatives. 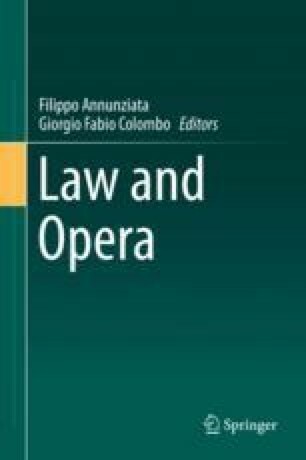 We present an analysis based on the importance of law in four nineteenth-century Italian operas, Bellini’s Norma and I Puritani, Verdi’s Aida and Puccini’s Tosca, in order to show that respect for the law is in fact one of the main ingredients in opera from the point of view of music and narrative. This usually neglected or hidden topic strongly contributes to opera’s beauty, high value and impact. Therefore, our analysis contributes to the philosophy of opera.